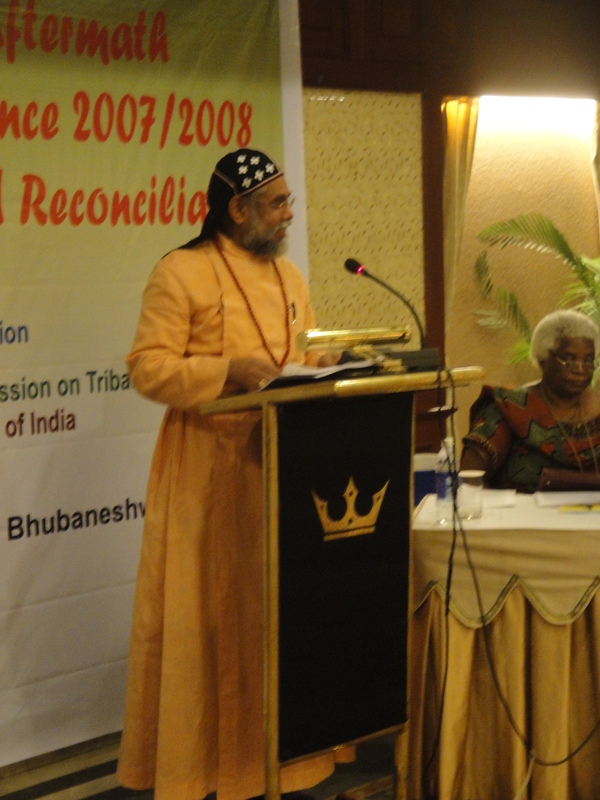 A Socio-Psychological Issue Before Jesus Dalit and Tribal Interface: Bhubaneswar. 17-1-2011 Bishop Yuhanon Mor Meletius, Orthodox Syrian Church, Thrissur Bible Study: Matthew 15: 21-28 An Indian author and diplomat Vikas Swarup wrote a novel in 2005 called Q and A. Hollywood director Simon Beaufoy and writer Danny Boyle made a movie out of it. The hero in the novel/ movie Jamal Malik lived in a slum in Juhu, Mumbai. For the Hollywood film makers he was a dog of the slum, so also every one in that situation. Jamal participated in a TV game show and became a millionaire. Still for the Hollywood film makers he continued to be a slum dog, of course a millionaire slum dog or a slum dog millionaire (I, for now, forget all the humiliating events that happened in the movie for short of relevance. It remains a question whether all Indians are dogs or only those living in slums alone are?. Of course it is a movie and it does not take our questions. It gives only the statements of its makers.). This is how the rich and the powerful, those who control the world affairs, those who make others slaves for the sake of their own agenda call those who are not equally powerful. Some dogs wag their tail and some others resist. But many go passive, those who can not do any of these, but feel the heat go crazy and hysteric. I did not hear many voices objecting the change in the title of the movie. Matthew 15:21-28. 21And Jesus went away from there and withdrew to the district of Tyre and Sidon. 22And behold, a Canaanite woman from that region came out and cried, “Have mercy on me, O Lord, Son of David; my daughter is severely possessed by a demon.” 23But he did not answer her a word. And his disciples came and begged him, saying, “Send her away, for she is crying after us.” 24He answered, “I was sent only to the lost sheep of the house of Israel.” 25But she came and knelt before him, saying, “Lord, help me.” 26And he answered, “It is not fair to take the children’s bread and throw it to the dogs.” 27She said, “Yes, Lord, yet even the dogs eat the crumbs that fall from their masters’ table.” 28Then Jesus answered her, “O woman, great is your faith! Be it done for you as you desire.” And her daughter was healed instantly. Let me start with a question. Jesus was in the region of Tyre and Sidon, in the land of the Canaanites or Syro-Phoenicians. What business he had there? Geographically the western region between Mediterranean and river Jordan where Israel settled is called Canaan (Nb. 35:10-14; Jos. 22: 10-11). This region was populated as early as 3000 B.C. According to Nuzi inscriptions from 15th to 14th C. B.C Canaan was famous for purple wool from which it got its name. Canaan also may mean ‘merchant’ (Isa. 23:8). The people of the region were Semitics like the Hebrews. They had independent cities and rulers for each of them. Israel settled first in hilly areas and then slowly came down to Canaanite cities. From 1992 to 1779 B.C, and again from 1550 till 1225 B.C. the region was under Egyptian rule. Later various groups like Barbarians (from North west),Philistines (from Southwest), Hebrews (from South East) and Arameans (from North East) came and pushed the people of the land to Labanese mountains and Canaanites had to confine themselves to the costal region of Tyre and Sidon which was also called Phoenicia. The Canaanites who were thus pushed to a corner survived by treaty or in subordination (Gen. 9:26; Jos. 17:13; Jg. 1:27-33. There was also social integration and assimilation. Jdg.3:1-6). The Canaanites engaged in ship building and trade. King Solomon and king Hiram of Tyre (969-936) were friends and cooperated in constructing the temple in Jerusalem and in trade (1 Kings 5; 9:26-28; 10:11-12). Later Ahab entered in to marriage alliance with them (1 Kings 16:29-33). Hebrew alphabet and language were influenced by Canaanite language. Hebrew religion also borrowed much from Canaanite religion. But eventually they lost the glory. The attitude of the Jews towards them changed considerably particularly after the exile and return. Jews considered themselves as an exclusive community and every one else subordinate and alien. Non-Jews wanted to protest, but was unable due to demographic, economic and political reasons. During Jesus’ time Jews enjoyed considerable amount of freedom both religious and social in the region even though Romans were ruling the country. So they were able to continue the dominating and oppressive attitude towards people of the land. They called the Canaanites ‘dogs’ and accounted them to be much lower in social status. To sum up, the Canaanites were people of the land and were subjected to invasion, enslavement, oppression and humiliation. Thus, we have in Matthew 15:21 ff. a story of a Dalit woman of Indian sub-continent. I do not want to go to the geographical and historical details in parallel. I take the story of Matthew than of Mark (7:24-30) which is probably the first and shorter, because Matthew has a longer passage with extended dialogue of Jesus with the woman. The message of the event is given to the Jewish audience of Matthew and hence would speak to our situation as well. The humiliating tone in the words of Jesus certainly reflect the attitude of the Jewish Christians of the early times and the response of the Church (we may refer to the situation expressed in the Jerusalem council reported in Acts 15). The primary purpose of the story may not be to present Jesus as a miracle worker since there are several other better stories that will serve the purpose. The whole setting of the story, to me, talks about the social status to which Jesus elevated the woman and her daughter and consequently the whole community of Canaanites. (This can be compared with the story of the Samaritan who helped the traveler on the road from Jerusalem to Jericho. There is a tendency to single out the person who helped the traveler and call him ‘the good Samaritan’. I think Jesus was referring to Samaritans as a community, not just one person). Canaanites or Syro-Phoenicians were a community who faced humiliating treatment and unjust dealing from the Jews who invaded their land centuries back. I consulted few practicing clinical psychologists to learn a bit about the condition of the daughter of the Syro-Phoenician woman. What is said in the Bible as ‘possession’ in modern terminology can be called hysteria, the cause of which can be socio-psychological frustration. I think this works very well with the stratified and unjust social order existed during the time of Jesus. Since the Canaanites were not in a position to rebel, they took it on themselves. In the illness of the girl, I see an expression of the rebelliousness on her part in response to this unjust social order. The mother is the representative of the older generation of the community that accepted the situation as normal. Her mind was already conditioned and had no problem in being called ‘dog’ (I have seen this happening in my own backyard in the so called ‘god’s own country’, Kerala). But for the younger generation, it was not at all acceptable. They wanted to change it. But opposition may have come even from their own older generation. This will cause an internal struggle in the mind of the girl which may affect the person and could be expressed in the form of hysteria. When the woman was taken to the status equal to that of Jesus’ own people, the dominant community, the Jews, the girl was ‘healed instantly’. Re-establishment of social status provides the girl wholeness. To achieve this goal, Jesus had to work slowly pushing the woman herself to that end. It was not a one sided act of charity on the part of Jesus. The goal was achieved by the woman herself with the environment and challenge created by Jesus. The woman’s urgent need and her love toward her daughter helped her fight for the cause all the way and reach the target. There is a slow, but steady progress towards the goal. The role of the community around specially that of the disciples is crucial. First, Jesus keeps silence (v. 22). But the woman did not get discouraged and leave. Rather continued to plead and the disciple had to intervene. Then Jesus gets a chance to respond. It is hard to believe that Jesus meant when he said, “I was sent only to the lost sheep of the house of Israel”. The immediate question would be, if that was the case, why was he there in the territory of non-Israelites? (Of course scattered Jewish presence was in that region. But was he there just for those few? He had been to gentile territory earlier and had worked miracles there too. Ref. Matthew 8:28 ff.). The woman was not ready to accept that comment either, rather she continued to press her case. Jesus’ second statement was more humiliating than the first. Jesus further tries to hurt her feelings and calls her indirectly ‘dog’. It was not only an insult for her, but also for her own community. With this, while for Jews, she becomes a representative of the community of dogs, but for Jesus of a community that can rise to the status of the Jews if not over it by faith. She challenges Jesus with a valid argument. She does not show any offence for being called a dog. This is a positive attitude on her part. She can not change the way others think of or talk about her. She is concerned of her rights and will go any far to get it protected or granted. Through her valid argument she claims her rights since dogs are part of the family and they too have rights. It is not a question whether she accepts the word others use to call her or not. What matters is what she thinks of herself and her rights. She claims that she too has rights in the family. Those who call her dogs are trapped in their own argument. May be this was an answer of the early Church before the Jews who were so proud and counted everyone else inferior. Jesus had no other go, but grant her demand. He gives up and makes a comment on her faith and grants her wish. Jesus in fact was slowly liberating her of her mindset and putting her in the right position. Her urgent need also helped in in the process. So far Jesus has been complaining about lack of faith of ‘his own’ people, the children. Now he was able to appreciate the faith of a person (of the community too), a woman first and on the top of it a Canaanite woman. With this appreciation of Jesus she is placed on the top of his own community. The Canaanite woman from under the table is elevated to the top of it and to the position of the children themselves, if not over them. Jesus had already thrown the children out from the table several times (Matt. 15:14. Take special note of Matthew 21:31b. “Assuredly, I say to you that tax collectors and harlots enter the kingdom of God before you”). What happens further is in response to the change of status of the woman and her child. Matthew states, “and her daughter was healed instantly” (15:28). The social uplift, self respect reestablished removes the reason for being angry, rebellious and hysteric too. The girl is thus cured and becomes whole. The new humanity Jesus creates does not look for claims of being children or otherwise. It only looks for faith that fights all the way up, to be considered equal and established in wholeness (see Peter’s address in the Jerusalem Council in Acts 15:6-11. “Now the apostles and elders came together to consider this matter. 7 And when there had been much dispute, Peter rose up and said to them: “Men and brethren, you know that a good while ago God chose among us, that by my mouth the Gentiles should hear the word of the gospel and believe. 8 So God, who knows the heart, acknowledged them by giving them the Holy Spirit, just as He did to us, 9 and made no distinction between us and them, purifying their hearts by faith. 10 Now therefore, why do you test God by putting a yoke on the neck of the disciples which neither our fathers nor we were able to bear? 11 But we believe that through the grace of the Lord Jesus Christ we shall be saved in the same manner as they”. We need to put this in perspective! Let me bring in few questions!! Why the Church is placed in this world of plurality and where people are hierarchically structured? Is it to protect the interests of the rich and powerful honoring their claims? Or to plan and workout ways and means of making the weak, the oppressed and marginalized whole, recognizing, protecting, and further helping them fight for, their rights? Just look at what happened in the territory of Tyre and Sidon and also see Jesus’ comment in Matthew 11:28 ff. (Come to Me, all you who labor and are heavy laden, and I will give you rest. 29 Take My yoke upon you and learn from Me, for I am gentle and lowly in heart, and you will find rest for your souls. 30 For My yoke is easy and My burden is light”). Why do people call others dogs? People call others dogs not because they are dogs, but because it will help those who call, to work out their agenda easily. First, it will create a subordinate mindset in them and they will always be obedient. They will not demand their rights, rather be content with charity. Second, this will give the oppressors a free ride and will help them continue their oppressive attitude. The oppressors on the one hand are limiting themselves in to a corner and on the other becoming a helpless people. When they realize that they are now alienated from others and are a helpless lot, they would try to get help through force. They can do that only until others are submissive to them. Once the enslaved people regain their self respect, the dominant community will become even more worried. So they try all they can to keep others from claiming their rights. One way of doing it is by demoralizing them through derogative names and titles. This is a universal phenomenon. For example, follow the recent events in the international arena. George Bush complained that Indians started eating more and that is why food price is going up in the US. He complained that more Indians are using vehicles and that is why fuel price is going up. The comes the movie, slum dog millionaire. Later Barak Obama asks Indians to invest in US. Few days earlier Manmohan Singh asked Indian to eat cheap food items to bring down the food price. Do you get the picture? You save money by buying cheap food and invest that in US so that companies like AIG can eat that money up. And our PM is all for it! Again political and religious fundamentalists will try to divide people and call one higher and the other lower not because they are so, or because god made them so; but because it will keep them divided and will never be united against the oppressors. Jesus did not categorize people. He only wanted all to be united in faith. He criticized Jews for not having faith. He hailed the Canaanite woman for having faith. This is an indirect call for Jews to have faith and be hailed by Jesus and the oppressed to gain self respect to consider themselves equal to the oppressor in status through faith and never sell them away to the oppressor. So what shall the Church in this part of the world do? Be present just like Jesus was present in the region of Tyre and Sidon. Work with people to help them slowly move upward and gain confidence in themselves. Adopt a social reformist methodology to emotionally and psychologically liberate them from being oppressed and marginalized. Help them to be aware of their rights and privileges and gather strength to fight for it. The story of the Canaanite woman with Jesus is a story from our motherland, India (the incredible India, the shining India, the land of the slum dogs). Jesus is here in our midst. An unjust social situation created by humans is prevailing in our country and in our society. Dalits and Tribes, the people of the land are being pushed away from main stream to the side walk and to gutters to be enslaved and oppressed. Their rights are denied by both political and social leadership. People respond to this in multiple of ways, some quietly surrender, some rebel violently and some go hysteric. Rather they should see the existential challenge before them just like the Canaanite woman did, and stand together against any kind of denial of their rights and violation of their human self. They have to claim their rights as humans just like any other human being in this world. Christ should be the source of liberation in all matters with creation and particularly human. Church representing Christ in this world today need to act on his behalf. It has two responsibilities. One, interact with the oppressed to give the correct perspective and support the struggle for justice. Two, to address the oppressive forces with the power of the Word. Be present and be liberative as our master was. .